Cleaning a sand filter with muriatic acid solution is often a much simpler process than cleaning a DE or Cartridge filter is, but this does not mean it is eating pudding either. However, with plenty of information and a little experience to help you through, you don’t need to worry about washing it the wrong way. Replacing a sand filter swimming pool pump and cleaning it tends to follow the same simple steps, with only minor differences; so, I will outline the steps for you. Cleaning a swimming pool sand filter won’t take more than 60 minutes. However, if you are completely removing and even replacing the sand in the filter, it might take longer. You will need to wash and backwash the filter much more regularly than you will need to add sand to it – you will need to clean the filter monthly to keep it working properly while you will only need to replace its sand once every few years. 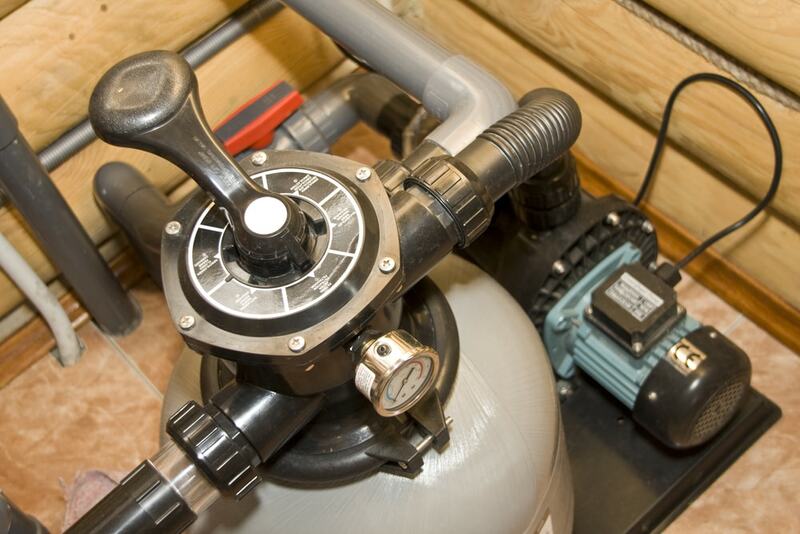 Cleaning and replacing the sand filter might seem similar tasks but they are different. Here are the steps of how to clean a sand filter with muriatic acid solution. If possible, unplug the pump and filter or disconnect their power source by turning off the power breaker that controls them (start with the pump). This is the best and fastest way to work on your swimming pool devices. Clamp your backwash hose or pipe to the water outlet on the filter and unwind it – ensure you do it completely. Furthermore, ensure that you check for kinks in the hose that might make the process to fail. Turn the backwash regulator or valve on your pool filter to the backwash position. This is usually labeled with different phrases such as “Push-pull”, depending on the unit you own. Secure the handle in place to make sure that the whole process continues as intended. Turn the pump and filter on again (start with the filter). You will see water gushing out of the valve almost immediately. Let this process to continue for about 5 minutes. You should wait until the water is clear when running out of the sand filter. When this happens, switch off the pump and filter once again. Now it is an ideal time to turn the handle back to its ordinary position and collect your pipe or hose. Ensure that you empty the pipe of any water that is still inside. When the pump and filter are still on, open the air relief regulator on the sand filter. When water runs out normally, shut it again. You can stop here if you simply want to backwash your pool sand filter system. For us, we want to clean our system with Mauriac acid solution and this means moving to the next step. Once again, turn off the pump and filter and remove the cover to the sand filter tank. You might require the screwdriver or wrench to do this. If the pool filter is held tightly with bolts or clamps, you can remove them by your hands – remember to wear your work gloves before you start the process. Look inside the filter. You will see a manifold that coils inside the unit, as well as lots of sand. Remove this manifold and take care not to destroy any of its fingers. Use a small cup to remove the sand a little by little until the sand filter is light enough to be picked up and dumped out. Once the filter is out, rinse out its inside with a hose to remove excess sand. Fill a huge bucket or basin with water and add one part muriatic acid to twenty parts water. Gently lower the sand filter into the solution and leave it to soak for about 10 minutes – until the bubbling stops. Remove your filter from the solution and rinse it with a hose and then reinstall it. Learn how to soak in acid in this video. Add back the required amount of sand to your unit. Your sand filter’s instruction manual will tell how much sand you will need to add in order to bring its pressure to the recommended level. Some sand filters won’t work properly if you add excess or less sand – they will simply display an error message. If you are using an alternative to sand, ensure that you read the instructions to know how to properly use this material – the right amount of sand for the filter. Put the sand or its alternative back and replace the manifolds. I would recommend that you fill the filter tank with sand to about 1/3 full, then insert the manifolds and continue to fill the rest of the tank. Be careful not to damage the manifolds fingers during the process. Backwash the filter once the tank is filled with sand (follow the first part of this article to see to properly conduct a backwash). You will be ready to go after the sand filter tank has backwashed. Let the system cycle for at least 30 minutes before you jump into your swimming pool again. Congratulations! You have successfully cleaned your sand pool filter with muriatic acid and know how to change the sand. Dirt is eliminated from a sand filter by reversing the water flow or backwashing. This process should be done when the pressure gauge reads a 7-10 lb increase over the ordinary operating pressure. Try the steps above. Pool Clarifiers and Flocculants: what’s the difference? !